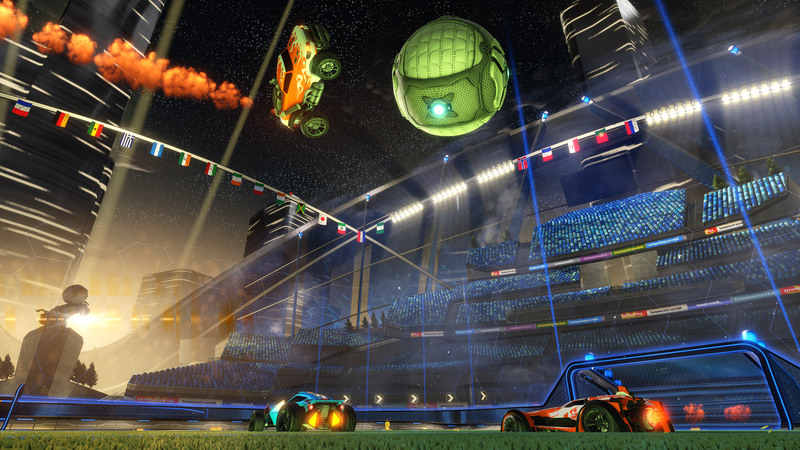 Rocket League is the sequel to the 2008 game titled Supersonic Acrobatic Rocket-Powered Battle-Cars, which sees players take control of remote control cars to play football. A simple idea, but one that has seen the game surpass 5 million downloads – which is nearly double that of its predecessor – from gamers all around the world. 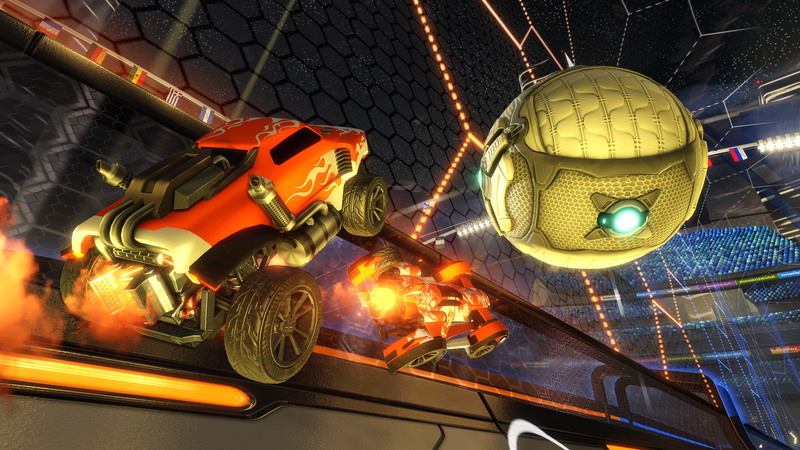 I am ashamed to say that Rocket League didn’t ping on my radar until it was part of July’s PlayStation Plus downloadable games. Initially, I gave it a quick go and didn’t think much of it. I returned to it a couple of weeks ago, but this time I had a few friends with me. My opinion of the game has since been altered quite drastically. 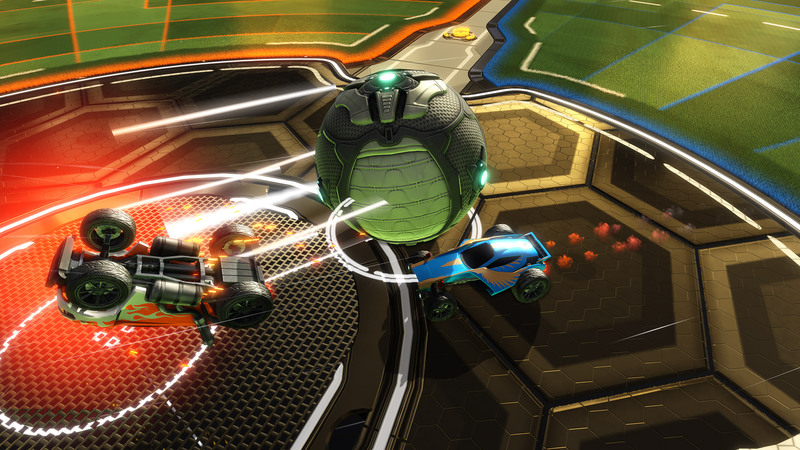 Rocket League is a pretty simple game. There are two teams, orange and blue, with each team able to have up to four on a side. The aim is to hit the ball into the opposing team’s goal. Easy, right? Wrong. Well, sort of. 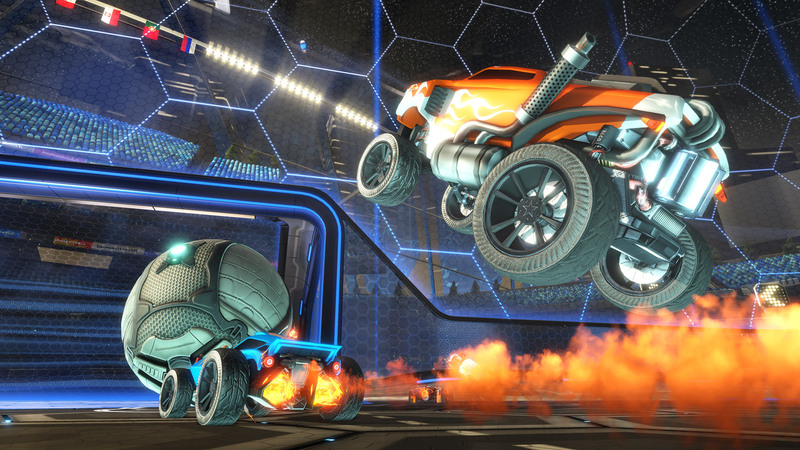 Rocket League is basically just remote controlled car football, with the occasional nitro-fueled boost thrown in for good measure. The difficulty comes from the opposing team, who like you, are also trying to score a goal. And sometimes, even from your own team. I found playing online with complete strangers to be more often than not quite frustrating. The match degrades into a cluster of ball hogging and goal stealing. Teamwork is tricky to get right, especially with no voice capabilities. 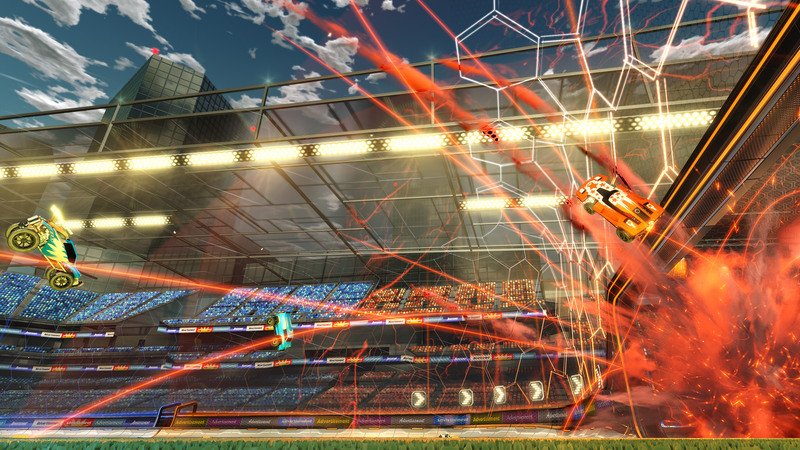 Playing with friends is where Rocket League truly shines. If you can pull three like-minded friends into your team, chances are you’ll do pretty well. The main aim is to score goals, yes, but points will also be awarded for assists – so if you help set up a goal, you’ll not be forgotten, saves – so keeping your goal free of the ball will get you a few points, as well as first touches and centering the ball on the field. I found that working together you work out the strengths and weaknesses of each player, and it’s best to build your offensive and defensive tactics around this. Through normal gameplay, you’ll unlock various paint jobs, cars, aerials and wheels. You can use this to customise your vehicle to something more of your liking. Currently, my car spits out rainbows when boosting – don’t judge, it’s awesome! You can also alter the colour of the vehicles to a degree, but ultimately the primary colour is locked to either a blue or orange hue. The unlocks are also random, and when unlocking a decal it doesn’t necessarily unlock it for all vehicles. 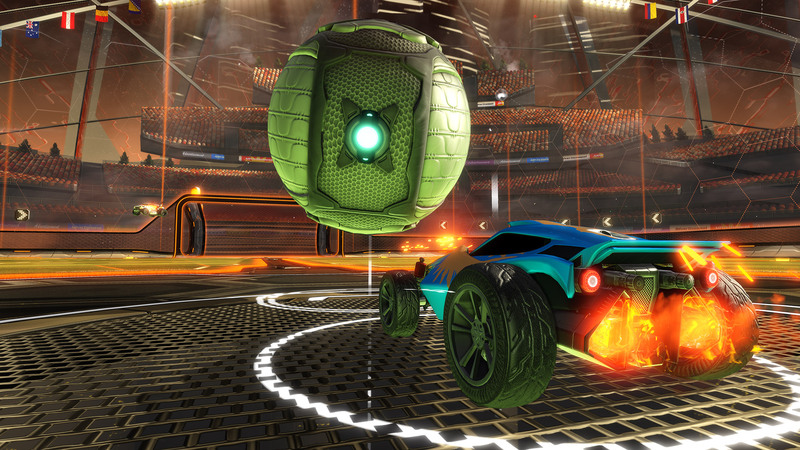 The game currently offers two main modes, ranked and unranked. 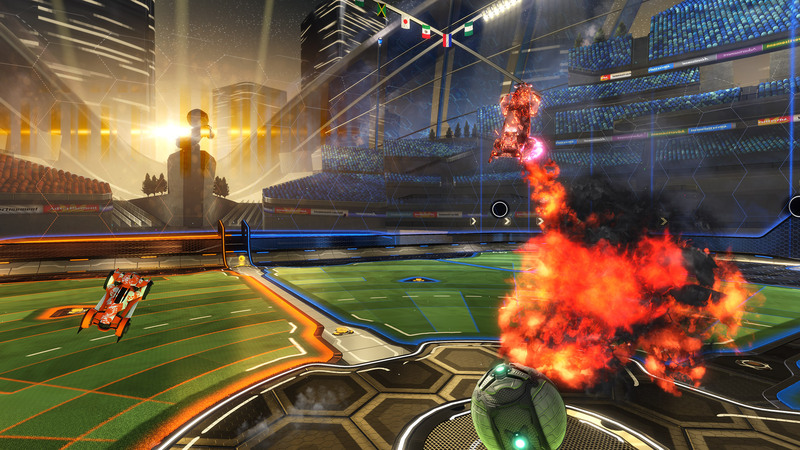 In each, you have the option to play 1v1, 2v2, 3v3 and 4v4. I personally found 3v3 to be the best mode. I found there were enough players on the field to make the games interesting, but not so many that it degraded into a ram-fest. When playing in the chaotic 4v4 mode, you really do need a team of friends with whom you can chat with while playing. Without this, I found players would just rush to get a goal, not thinking of the match as a whole and ultimately sacrificing goal defence for those few seconds of glory. 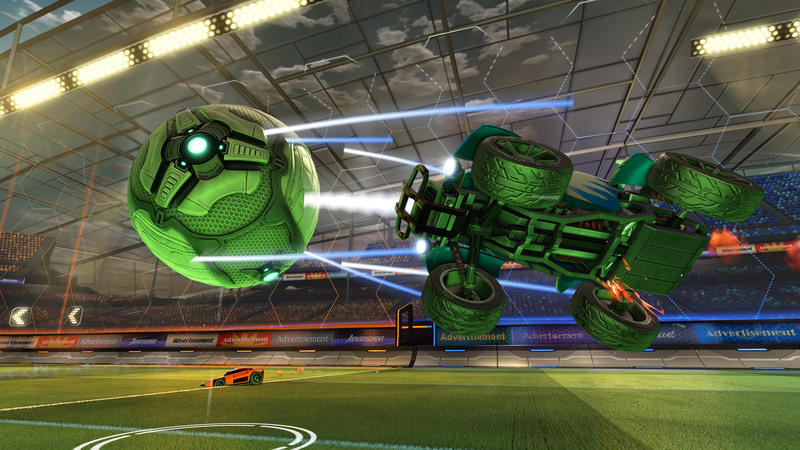 A feature that I like about Rocket League is that the last player to touch the ball is the one who is attributed to the goal. Granted, this can sometimes be a bit of a pain when an overzealous player steals a goal, but for the most part, it works quite well. Own goals are allocated to the last member of the opposing team to score a goal, so no negative scores are obtained. After each goal players are treated to a quick replay, showing off your awesome skills – or sometimes, your epic shame if it were an own goal – which all players can choose to skip if they so wish. As the name suggests the cars are equipped with rocket boosters. Collecting pickups which are scattered around the pitch build up your boost which you can use to help close the gap between you and ball in a pinch. 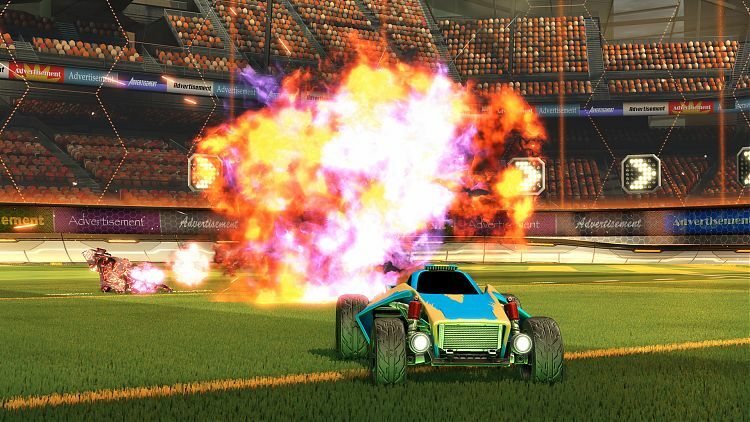 A fun addition that Psyonix has added in is the ability to destroy opposing players. 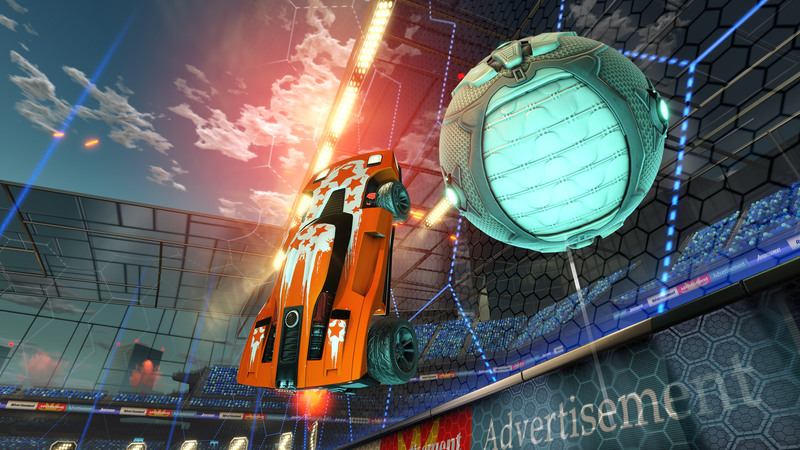 Hitting a player head-on at full speed will destroy their car, removing them from the field for a few precious seconds. This can come in handy if you need to clear the ball from being in close proximity from your goal, or even just to keep the other team’s numbers down. A tactic my friends and I found to be successful was to allocate two players to scoring and midfield, one player to hover around the goal and for the fourth player to cause as much havoc that was humanly possible. It certainly worked, though I have a feeling the morality of this could be brought into question. 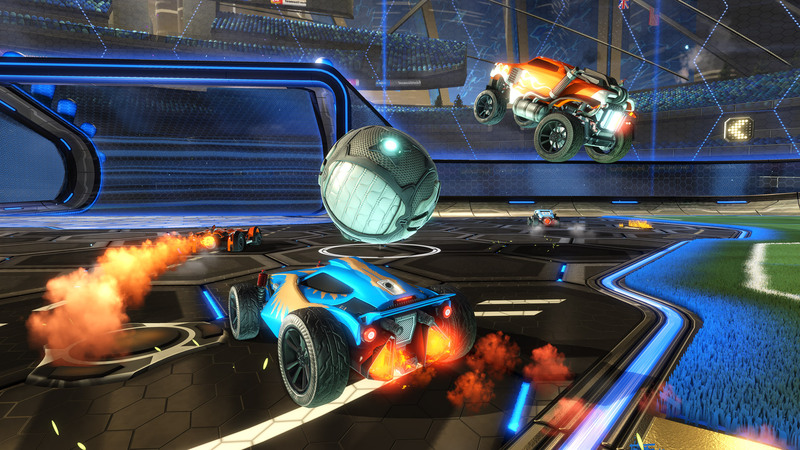 Overall, Rocket League is an incredibly fun game. I’m not at all interested in football, but the addition of rocket-powered cars certainly changes things up, a lot. 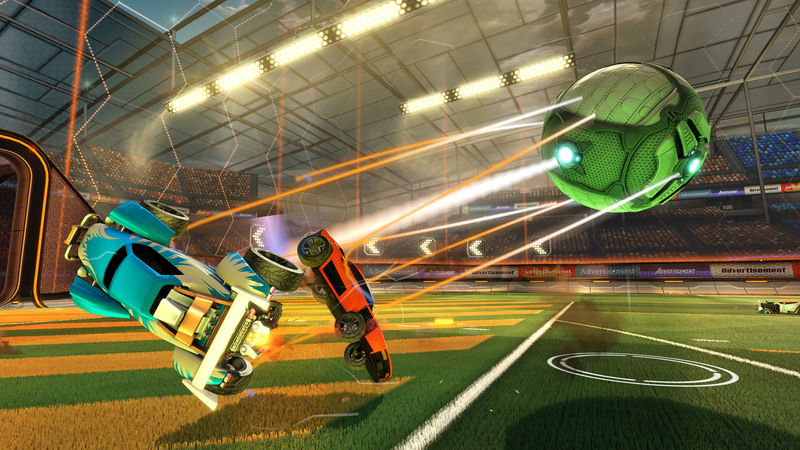 Playing with friends is the most rewarding, and nothing beats the feeling of scoring the perfect goal. 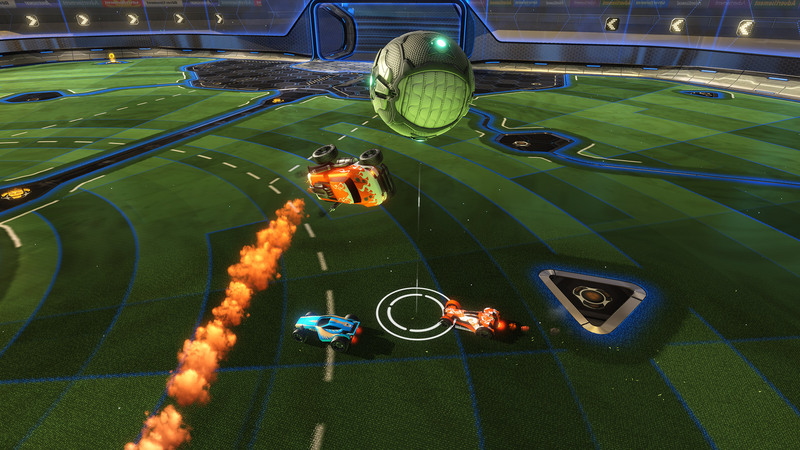 I like that Psyonix has added in points for those who may not be the best at scoring goals which, in the end, promotes teamwork; even if this does not always work when playing with strangers. An incredibly fun game which will draw you in and keep you wanting more. 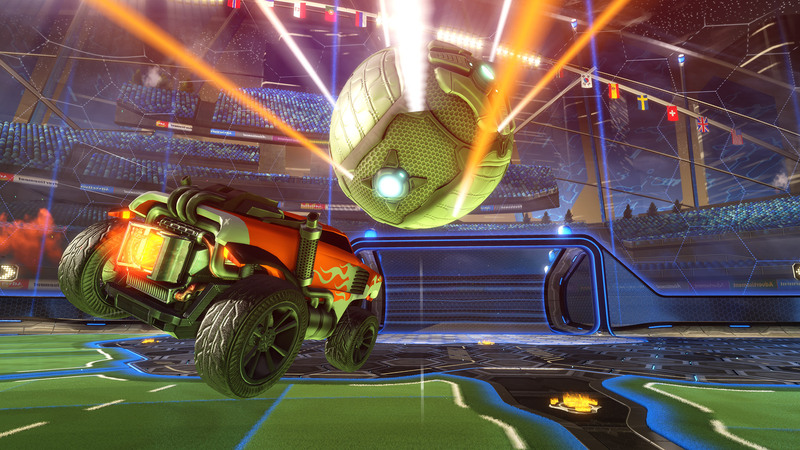 This review is based on playing the PlayStation 4 version of Rocket League .